I recently came across this blog post from Love, Light, Laughter, and Chocolate - One Mom's Journey. On the anniversary of her daughter's passing, Kim wrote this post about how her daughter, 3 year old Meggie, was the victim of something many of us don't worry about in our homes. Her bedroom dresser was not anchored to the wall and was pulled down on top of her. It took several tries to get through her heartbreaking post, but one thing was for certain - it was not something I was going to read and easily forget. Kim's message, her plea to all parents, was not an unreasonable one; anchor your heavy furniture to the wall and potentially save your child's life. Now, we're not huge baby proofers. We have outlet covers to protect curious fingers, knob covers on our exterior doors, and cabinet locks to keep cleaners hidden away, but that's about it. We didn't go nuts with drawer locks or door jam stoppers - we took that part upon ourselves to teach C not to touch certain things. We thought it was important to find a good balance between safety, learning, and independence. After all, the outside world isn't baby proofed and when we say, "please, don't touch that" he needs to know we mean it. But furniture? C wasn't a chronic climber, so that wasn't a problem. Well, neither was Meggie. It only takes one attempt to get a book off a high shelf, one try to grab their cup off the dresser. As I read the story, there were three items in our house that immediately came to mind - C's dresser, the 6' tall bookcase in the living room, and the 42" flat screen TV. None of them properly secured. After reading Kim's post, I quickly hopped onto Amazon and ordered anchor kits for these pieces (and a few extra). For a total of $30, we can secure these items and have piece of mind. For the furniture, we ordered Quakehold! 7" Steel Furniture Cables and for the TV we ordered Kidco Anti-Tip TV Straps . Its as simple as drilling a few holes and could make all of the difference. Installing the Quakehold! kits was simple. We had some assistance from the maintenance crew in our building since our walls are backed with concrete, but in a regular house with studded walls, it would be just as easy. We put one cable kit on C's dresser right in the middle. The bookcase got two cable kits in the upper corners as well as some wood shims under the front legs to prevent the squishy carpet from matting too much and creating a gap. Holy moly - both of these pieces are now ROCK solid and not going anywhere. 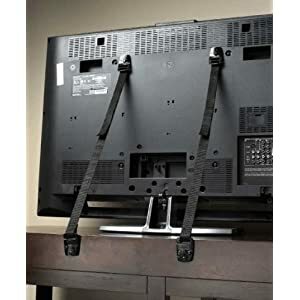 A bonus is that the cable kits are made to unscrew quickly to retrieve fallen items or clean behind the furniture (ya know, if you do that kind of thing). Don't think just because your little one isn't "a climber" that they will never be. We use car seats even when we haven't been in a crash and we cut up their food in tiny pieces even if they've never choked. It only takes once to regret. Just ordered the straps from your link! This post was a good reminder. Better do it now before it is too late. By the way, I am glad you are blogging again. I enjoy reading just a facebook post here and there.